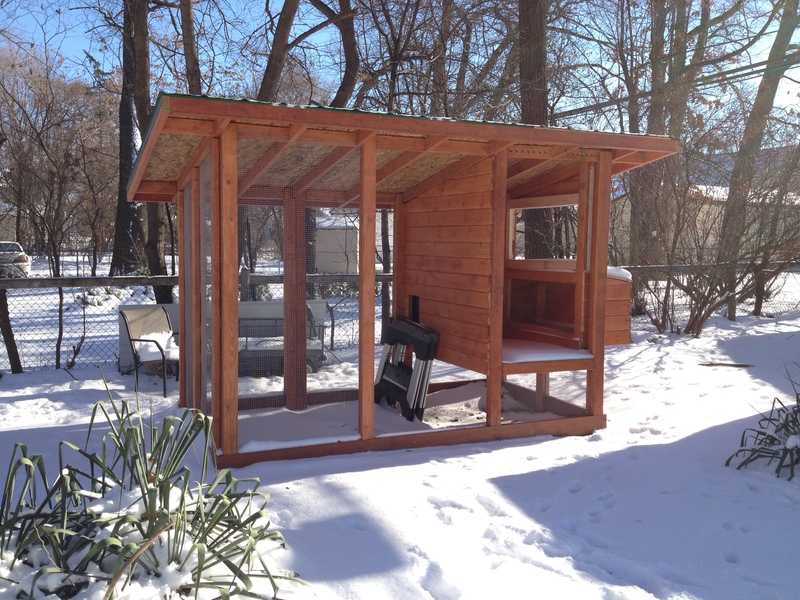 We just had our first significant snow of the season, and the coop looks great. From this angle you can see that we need to finish two doors, then we’ll be ready for inspection. So this morning, as I was snuggled in with my cup of coffee, I noticed two men clomping through the snow in my neighbor’s yard. They stopped near the back, and pointed at my chicken coop. Without thinking, I shoved my bare feet in my winter boots, and ran out in my pajamas. The two men had just got back in the car and were pulling out of the driveway. “Oh that’s your coop?” the driver asked. “We’re in training today, and I couldn’t believe my luck when I saw it.” He explained they had been discussing the chicken ordinance when they came upon my coop. I could feel my feathers fluffing. I explained my boyfriend and I (and a couple buddies) built it ourselves. I also told him we planned on finishing in the next few weeks (we just have those pesky two doors to build) and that I’d be in touch. The building inspector extended his hand, and introduced himself as Chris. He slipped me his card. “I look forward to coming back out and getting a closer look,” he said. Me too. This was just the motivation I needed to finish the job.